Cobalt Blue National Trust Mug is part of the Keith Brymer Jones National Trust Collection. 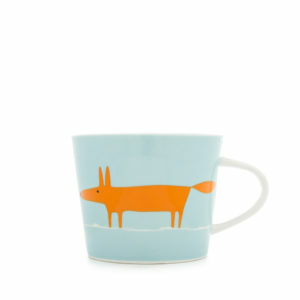 A colourful range of six mugs, partially-glazed in clean & understated hues. Keith created the colours to reflect the dramatic coastlines, wide open landscapes, historic architecture and treasure trove of arts & antiques that he discovered while visiting National Trust locations. The Cobalt Blue National Trust Mug is part of the Keith Brymer Jones National Trust Collection. There are six clean & understated colours in the range, partially-glazed with an exposed porcelain base. Each hue is inspired by different aspects of the National Trust and English countryside. The intense hue of cobalt blue has featured in eighth-century Chinese blue & white pottery and, by the 1800s, it was the pigment of choice for Turner, Renoir, Monet & Van Gogh when capturing the sky. The rich heritage of cobalt blue inspired Keith’s choice of this vivid and graphic hue for his National Trust Collection.